LubriLAST™ coatings contain no organic solvents. Safer and cleaner manufacturing processes are used, and any concerns about residual solvents in a device are eliminated. LubriLAST™ coatings virtually eliminate the coefficient of friction in aqueous environments. LubriLAST™ passes all stringent biocompatibility tests associated with tissue and blood contacting devices. LubriLAST™ is patent protected (US#6,238,799; US#6,866,936) and used in a number of approved devices used in neurovascular, cardiovascular, urological, and surgical applications. 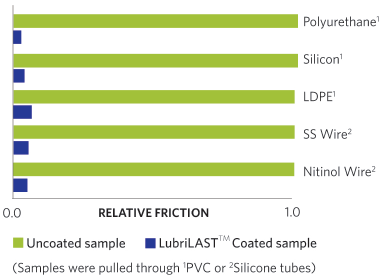 LubriLAST™ retains its physical integrity and lubricity even after hundreds of cycles. LubriLAST™ withstands use in the tortuous paths found in physiological systems without flaking or delamination. It can be applied to balloons used in a number of medical applications. In LubriLAST™, a long chain, bio-compatible hydrophilic polymer is incorporated into the coating. Part of this long hydrophilic polymer becomes entangled with the supporting network while other part remains exposed and able to become hydrated. When in the presence of water or body fluids, the hydrophilic polymer adsorbs water molecules to create a watery interface at the surface of the device. The water cushion reduces wet friction, protein adsorption and cell adhesion. * Data developed via modified D-1894-95 protocol. Test performed in water, samples pulled against polyethylene. Shelf life: LubriLAST™ sterilized products have a shelf life of 3 years.